Another Old Wives’ Tale about the 1989 Hillsborough Disaster continues to rear its ugly mush intermittently, sometimes through cynical smear tactics, sometimes through innocent misinformation. This Tale is just a variation on the old ‘Ticketless fans caused the Disaster’ crock, and it is inaccurate for exactly the same reasons, and others besides. The myth is that the crush that took ninety-six lives had formed in the Leppings Lane end of the Hillsborough Stadium because large numbers of Liverpool supporters had been able to get in without paying, by use of forged match-tickets. 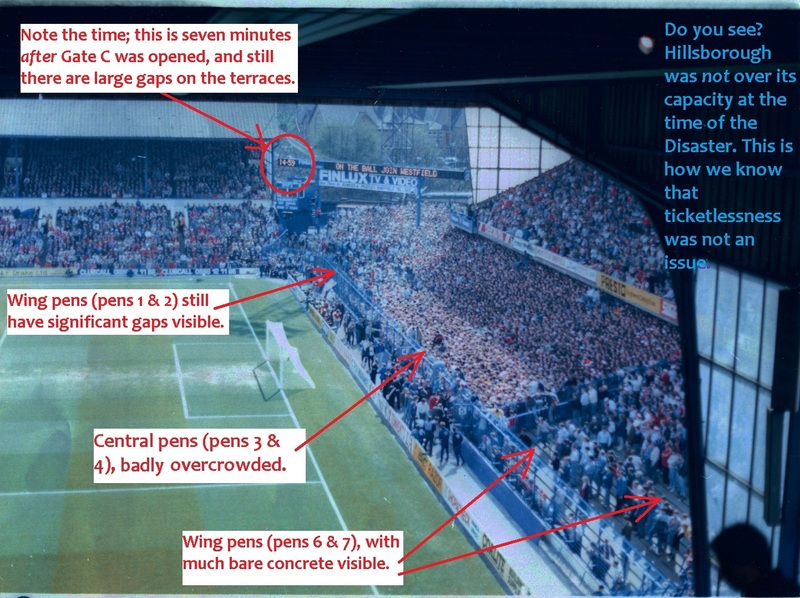 Now, as has been pointed out more than once on this blog and on many other websites concerned with the Disaster, the myth of too many spectators being in the ground is a non-starter, because the Leppings Lane terrace was not over its official capacity. Analysis of all available admissions evidence by the Health & Safety Executive pointed to the likeliest approximate number of spectators in the terrace being several hundred below its capacity. The real reason for overcrowding was uneven distribution of the attendance into enclosures that were fenced off from each other. But looking narrowly at the question of whether there were any spectators getting forged tickets, the answer is a resounding ‘no’ anyway, whatever the actual attendance might have been on the day. No evidence was ever found to suggest that even one supporter, of either Liverpool or Nottingham Forest, had gained entry using a forged ticket. More than that in fact, no evidence has ever been found to suggest that tickets had been forged for that FA Cup semi-final at all. This total void of evidence is in spite of the very deliberate, very conscious, and very concerted efforts on the part of the police to prove that there had been forgeries in circulation on the day of the Disaster. The West Midlands Police, during their ‘strictly-going-through-the-motions-and-nothing-more’ investigation into the conduct of the South Yorkshire Police at Hillsborough, actually went as far as to seize a large number of the used semi-final tickets from Sheffield Wednesday Football Club, and then submitted a hundred of them that they felt looked ‘most suspicious’ to the Forensic Science Service Laboratory in Birmingham. Requesting a full analysis, the West Midlands Police gave an instruction in somewhat loaded terms; they did not ask whether there were any forgeries among them, but instead asked the lab, “to establish how many of the sample of one hundred are forgeries” (bold emphasis mine), thus indicating that the police were just taking it as read a priori that forgeries were in the mix. The ‘Senior Scientific Officer’ at the lab performed the analysis as requested, and his findings fell into two categories. Firstly, a legitimate ticket issued by Sheffield Wednesday always had an owl emblem comparable to the image on the club badge imprinted near the right edge. The Owl emblem that dominates the badge of Sheffield Wednesday Football Club. This emblem would only become visible when the ticket was exposed to ultra-violet (UV) light. When the tickets from the semi-final were exposed to UV light, the emblem showed up on ninety-eight of them – the only two tickets that it did not appear on were damaged tickets from which the right edges were missing altogether, so there was no way to check. It was possible for a forger to synthesise such a watermark, but only by using the top tools and skills of the day. Therefore, only a professional counterfeiter could have done it, and as a rule, professional counterfeiters only ever mass-produce such tickets, in order to maximise profits – if such foul play were involved at Hillsborough, we can be confident that the stadium’s capacity would have been exceeded by hundreds. Secondly, the text on legitimate tickets was always in a particular purple-tinted print. Close analysis of all the questioned tickets found that the print conformed nicely to the colour, font and quality of an officially-issued ticket. Detailed analysis of even the most suspicious looking tickets the police could find revealed NO evidence of counterfeiting. And those were all the likeliest candidates for forgeries. The whole ‘issue’ of fake tickets was yet another speculative, unsubstantiated product of police imagination; guesswork, no more, almost certainly fuelled by the ongoing desire to shift blame for the Disaster onto the Liverpool supporters. To claim, as many supporters of other football clubs still do even now, that these imaginings are a serious possibility, even after such a premeditated investigation turned up nothing, is akin to assuming that Star Wars must be real simply because George Lucas imagined it. I’ve said it before, and I’ll say it again; critical thinking is something that really needs to be taught in schools. It would help a lot of people to look a lot less stupid in adulthood. I raised a Spock-like eyebrow the other day when, while browsing the website of the Liverpool Echo, I stumbled across a feature by Dan Kay about no less a figure than Christopher Whittle. Anyone who has been following the Hillsborough Disaster Index on this blog will be aware that Whittle has been, intermittently, a very bitter sparring partner of mine in Hillsborough discussions. What makes him somewhat unusual is that he is a man from the opposite ‘side’ from the one against whom I usually get into blazing rows on the subject. Far from being the usual boneheaded South-Yorkshire-Police-apologist, Whittle is instead a survivor of Hillsborough and maintains that the police were the overwhelming culprits on that dreadful day. Now, he and I are in total agreement (even though he may not actually realise that) on most aspects of the Disaster and the ensuing police cover-up, but there is one detail on which we are firmly at loggerheads. He is perhaps the epitome of what I term a ‘Category 5’ – please see the ever-growing essay I have written on Discursive Types – which is to say, he is a supporter of the campaign for Hillsborough justice who is unwaveringly convinced that the establishment cover-up that followed the Disaster was really the handiwork of the Conservative Government of Margaret Thatcher. He therefore quickly developed a rabid hatred of myself when he saw that I had the barefaced nerve to explain out loud why I don’t think that this is likely. Kay’s article explains in some detail Whittle’s very correct exasperation with the Mental Health Service in his native Burnley over the ‘issue’ (I put that word in inverted commas because I find it genuinely incredible that anyone could doubt that he has the condition) of whether he should be diagnosed with Post-Traumatic Stress Disorder. After Whittle had made many attempts to get the Health Service to take his problems seriously, they finally relented and allowed him a psychiatric assessment, at which the consultant seemed to agree that Whittle had all the symptoms of PTSD, but still refused to diagnose him as a sufferer. “I spent over two hours telling him my life story and at the end of it he refused to give me a diagnosis of PTSD, despite admitting I had all of the symptoms – nightmares, panic attacks, flashbacks, anger, resentment, frustration, low self esteem and paranoia. “He said I had achieved many things in life, such as going to university and getting a degree and being able to start a family so I could not have PTSD. “As far as I am concerned, I have achieved things despite having PTSD. “This guy simply did not have a clue, especially about Hillsborough. He said ‘wasn’t that caused by a fire?’ – he was confused with the Bradford Fire tragedy. Now, I have to temper my remarks with a few notes of caution here, as I have seen sadly ample evidence in my arguments with him, and indeed in his lukewarm book, that Whittle is – what’s a polite way of saying this? – a ‘less-than-reliable exponent’ of the art of reported speech. He is never above substituting accusation for supporting evidence, nor is he above resorting to the most outrageous strawman arguments, including deliberate misquotations (which he has done to me often enough…) or out-of-context ‘quote-mines’. Nor is he afraid of shouting down and bullying people who disagree with him, or of making quite preposterous claims of being witness to things he couldn’t have seen. Indeed, in this case we do only have Whittle’s word for it that the consultant who assessed him really did say these things. Part of the reason for that is the stance adopted by the Burnley Mental Health Services themselves, which is that they will not discuss the consultation with the media due to patient confidentiality. But this is in fact the main reason why I suspect that in this case Whittle is telling the truth and nothing but the truth. (The whole truth, I’m not so sure about, but I doubt there would be any other details that could put this latest sorry chapter into a happier context.) I find the declaration that the Burnley Mental Health Services must respect the confidentiality of the patient to be a laughable cop-out, given the fact that the patient himself is the one who has spoken out on the subject, freely waiving that right-of-confidentiality. Whittle’s complaint against the Mental Health Services is three-fold and very serious; he is in effect accusing them of appointing a consultant who is, on a factual level, totally ignorant of the root causes of his patient’s illness, of employing consultants who show a lamentably slight capacity for listening to patients, and of appointing a consultant who delivers a non-diagnosis that is transparently at odds with all the evidence. Surely the Mental Health Services are obliged to respond to that just as publicly, either as a fair defence of themselves or as a process of ordinary accountability? Instead, Burnley Mental Health Services remain suspiciously tight-lipped as to what really happened, even though, by implication of Whittle’s own actions, they have been given a free hand to speak openly. Oddly, I find the consultant’s pattern of ignorance – especially his half-attentive reframing of the information Whittle presented to him – ominously familiar, and therefore I am doubly convinced that Whittle’s account of events is correct. A description of the Hillsborough Disaster being twisted into something simplistic and victim-blaming matches almost exactly the cross-examination of witnesses at the Coroner’s Inquests into the tragedy in 1990-1991. Those Inquests, now thankfully quashed, saw many survivors giving witness evidence only to find their words being routinely twisted by legal counsels representing the South Yorkshire Police, and sometimes even by the Coroner himself, Dr Stefan Popper. (If you can still find a copy, I recommend reading No Last Rights: The Denial Of Justice & The Promotion Of Myth In The Aftermath Of The Hillsborough Disaster, by Phil Scraton, Ann Jemphrey and Sheila Coleman, which gives a substantial breakdown and analysis of many of the flawed Inquest proceedings. In particular, study pages 127 to 149.) References to growing crowd pressure were subtly turned under cross-examination into references to “pushing” and “surges”. Rumours of excessive drinking were turned under cross-examination into statements of ‘impermeable fact’. On a much smaller scale, Whittle, who himself will be a witness at the rebooted Inquests in the weeks ahead*, was given a taste of what other survivors were put through over twenty years ago. Paradoxically, his assessment may be useful preparation for what he will have to face in the near future, but even that is only making the best of a bad job. But I can’t help feeling that the whole conduct of Burnley Mental Health Services can be summed up in a single word – ‘cheap’. I don’t just mean that they’ve treated Whittle cheaply (although they have), I mean everything about the process smacks of penny-pinching. They refused to give Whittle an assessment for PTSD for years, then gave him an assessment to be run by a guy who seems to have a disorder of his own – of the attention-deficit variety – and was determined to find a label for everything connected with Whittle’s problems except the label that should so clearly apply. If there is one truly bad side to all the breakthroughs on the subject of Hillsborough over the last eighteen months, it is that the truth was unburied precisely when it was. More even than the inexcusably long time that the real story was kept shamefully quiet, it is a great pity that at the time it was finally exposed to the real world, it had to be in a period of what is politely called ‘Austerity’. Now I have detailed elsewhere why the ‘economic crisis’ of the last six years is largely a fantasy, as well as why the Government’s approach to resolving it only serves to slow down any recovery. But whether ‘Austerity’ is for the better or for the worse (hint: definitely for the worse), the simple fact is that it has dominated the policies of the coalition Government, and public Health Services are among those to suffer a mean squeeze of funding. Quite simply, in their desperation to fit performance to the limitations imposed on them by Government programs, different branches of the National Health Service, and of the Department of Social Security, are cutting back on resources, and sheer time, that they are able to allocate to members of the public. Add to this the almost zealous pressure that the Government is applying to reduce the numbers of people classed as incapacitated, and it follows that the outcome of Whittle’s assessment, once it finally went ahead, was all but a forgone conclusion; the Burnley Mental Health Services had almost certainly decided from the outset that Whittle should not be diagnosed with PTSD, simply to make sure that he could not claim any state-funded support. Hence their reluctance to speak out when he went public with his complaints. Had Whittle been able to get his assessment in, say, 2006, well before the Austerity period began, they might have handled it a little more honestly, and the assessment might have been easier to obtain earlier if the Hillsborough Independent Panel had been set up correspondingly sooner as well, bringing the plight of the survivors to public attention at a time of economic prosperity. After past run-ins with Whittle, and being quite startled by his aggressive, bullying dishonesty, I find it very difficult to feel anything other than dislike for him on a personal level. Even while recognising that the Post-Traumatic Stress is probably the very cause of his disagreeable nature, I still find his tendency to take it out on people who have done him no wrong (outwith merely disagreeing with him), and to feel that Hillsborough justifies any abuse or lie he is guilty of, to be quite repellent. But in this instance, he has my complete sympathy, as I have very little doubt at all that his complaint against Burnley Mental Health Services is entirely correct. Furthermore, I would argue that his mistreatment by under-pressure public institutions is an object-lesson in why the Government’s current public sector policy is not only self-defeating folly, but also morally-bankrupt. * EDIT 19th SEPTEMBER 2014: An important correction. Charlotte Hennessy has made clear to myself, and indeed to Christopher Whittle, that it is not true that he is to speak at the Inquests. I and others got the impression that he would appear at the Inquests after Whittle himself announced his attendance in February – via the Burnley Express for some reason – but that was in fact some time before the witness list had even been selected. By May, the witness list had been finalised, and Whittle was not on it after all. Charlotte tells me that he is categorically not going to speak at the Inquests as things stand, and that it is unclear where he got the information from to the contrary. Certainly she never told him any such thing, and nor did anybody else on the legal team representing the bereaved.